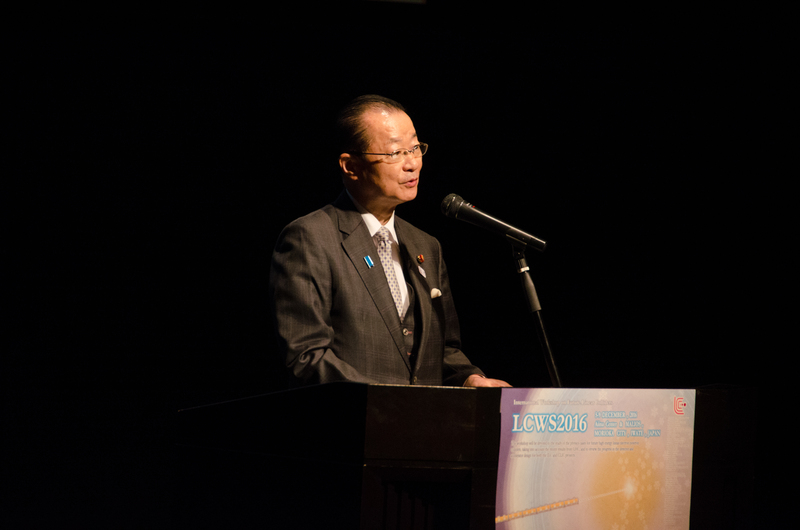 Here is the speech delivered by Takeo Kawamura, member of the House of Representatives, on the opening day of LCWS2016.Translation thanks to the workshop local organising committee. “Good morning, ladies and gentlemen. I’m honored to be here and to speak about the ILC. I am Takeo Kawamura, a member of the House of Representatives. I serve as Chair of the multi-party Federation of Diet Members for the ILC. Joining me here today from the Federation are Hon. Shun-ichi Suzuki, Vice-Chair of the Federation, and Hon. Hinako Takahashi. Today I’m pleased to extend my greetings to you on behalf of the Federation. Five years ago, the Tohoku area suffered unprecedented damage from the catastrophic earthquake. Since then, I have visited the Tohoku area, many times, and I am beginning to see the return of hope. Our government will continue to make great efforts to restore the Tohoku area. Some of the major issues Japan is facing are the restoration from the Earthquake, and how to bring about domestic growth and regional revitalization. They are part of my responsibilities in my party. Education and science and technology are among the most important issues for the growth of Japan and the rest of the world. It is crucial for our country to become increasingly internationalized, to develop the nation from its various regions, to promote science and technology, and to cultivate persons with challenging spirits. The ILC has great potential to fulfill these agendas and to become a model case for resolving issues through internationalization. 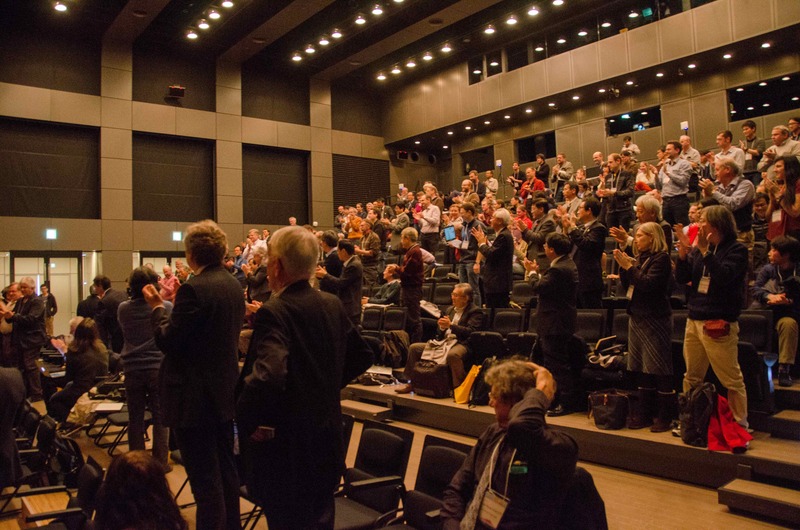 Our Federation was founded in 2006 under the leadership of Chairman Kaoru Yosano, initially within the Liberal Democratic Party, and became a multi-party federation in 2008, and has now expanded to about 160 Diet members. When I was Chief Cabinet Secretary under Prime Minister Aso, a meeting of 7 Ministers was held at the Prime Minister’s Office to learn about the ILC. Nobel Laureate Prof. Koshiba was invited to the meeting. Among the members were Hon. Yosano, who was Minister of Finance, Hon. Nakasone, who was Minister of Foreign Affairs and is now working on US-Japan cooperation on ILC as Chairman of the Japan-US Parliamentary League, Hon. Shionoya, who was Minister of Education, Culture, Sports, Science and Technology and is the Director-General of our Federation, as well as Hon. Nikai, who was Minister of Economy, Trade and Industry and is the current Secretary-General of the Liberal Democratic Party. This meeting has triggered the major political involvement for the realization of the ILC. Eight years ago, I had the opportunity to speak at an international conference for linear colliders in Sendai. We have made major progress since in the research and technology, and particularly in politics. The Director for Particle and Nuclear Research Promotion from MEXT is joining us today amid the ongoing budget negotiation with the Ministry of Finance. At MEXT and the Ministry of Foreign Affairs, many, including the Ministers, have been working hard to advance the discussions within the Japanese government and between nations. The official government-level consideration of the ILC began two years ago. This spring, parliamentary and governmental discussions between the U.S. and Japan began as well. Furthermore, in these two months, we began communication with parliament members from Europe and Asia. Prime Minister Abe, in his speech at the National Diet, referred to accelerators as drivers for innovation, along with the oft-mentioned space and ocean development. The word ILC came up numerous times in the National Diet amid the questions and answers exchanged involving the Prime Minister, MEXT Minister, and others. In these few years, we are intensifying our efforts to create an international environment suitable for realizing the ILC. The ILC is an international project which cannot function without the collaboration of many countries. Triggered by the completion of the ILC Technical Design Report at the end of 2012, the Federation responded immediately in January 2013 to strengthen international collaboration. After Prof. Koshiba and Prof. Lyn Evans paid a courtesy visit to Prime Minister Abe, Hon. Shionoya and I visited Washington DC, and there, we had first-time discussions with Congress members and staff about the ILC. This was followed by many discussions with Congress members and high-ranking officials from the US government. The movement picked up speed last year. In particular, when Prime Minister Abe spoke in a joint session of Congress, which was a first in Japanese history, Hon. Shionoya and I, as well as Hon. Suzuki here travelled to the U.S. to witness this memorable event. During this period, we held discussions with Dr. John Holdren, senior advisor to President Obama on science and technology, and Dr. Ernest Moniz, Secretary of Energy, as well as Congress members who specialize in science and technology and US-Japan cooperation, about strengthening US-Japan relations in the fields of space, energy, accelerators, and others. In particular, dedicated discussions about the ILC continued in Tokyo and Washington. Come to think of it, I visited Washington in December last year. In February of this year, Hon. Shionoya, Hon. Suzuki, and Hon. Otsuka visited the U.S. along with a high-ranking officer from MEXT, and held discussions with the Director of Office of Science, Department of Energy, and in May, it was agreed to start the US-Japan joint discussion group about the ILC. The Federation receives continuous updates from MEXT about the US-Japan discussion group for the ILC. The US-Japan collaboration on cost reduction will start, as the first task towards the realization of the ILC. Movement also began in Europe and Asia. At the Inter-Parliament Union held in Zambia this year, Hon. Suzuki here met with parliament members from Europe to discuss about the ILC. The results of these efforts became visible in October of this year. First, a meeting with important members of the German Parliament was held in Tokyo. Then, at the Inter-Parliament Union in Geneva, a meeting took place with a Parliament member of India. Furthermore, at the IEEE conference in Strasbourg, two members of the Federation, Hon. Ito and Hon. Shina, participated in discussions about efforts in Japan to realize the ILC as well as strategies for cooperation between Europe and Japan. This event was facilitated thanks to many of you in Europe. As there were many participants from Europe, US, Russia, China, and many other countries at IEEE, I am sure many of you here were also present. Among those present include a former minister and former longtime member of the European Parliament, who agreed to help us connect with other Parliament members. This success owes to the cooperation and support of everyone involved. Starting with the US and Japan, we now have an entry point to the governments and parliaments in Europe and in Asia. But the main part of the battle is just ahead of us. Cost reduction is an especially pressing and challenging issue, which must be surmounted by worldwide efforts. The ITER project, which I worked on as Minister of MEXT, was realized by significantly reducing the original cost. For Japan and other countries, the lower the costs are, the faster the negotiations would progress and hence the faster the realization. Thus it is of utmost importance to reduce the cost. However, we cannot afford to spend too much time on cost reduction. What will happen next year will be critical. Though many hard decisions will have to be made, it is our hope that prospects and direction will be shown in a timely manner. While it is true indeed that fundamental science does not directly produce money, we have come to appreciate through many years of studying that it gives rise to far more valuable things than just money. At present, there are about 160 Diet members involved in this Federation. It is often difficult to convince the general public about the usefulness of fundamental science. However, we mustn’t forget that without fundamental science, there would be no televisions, refrigerators, computers, nor cellular phones, and neither would there be medical technologies. The ILC is anticipated to give rise to many spinoffs from its accelerator and sensor technologies. However, I think there is something even more important. Prof. Osumi, recipient of the Nobel Prize in Physiology or Medicine this year, has repeatedly stressed that “Society would fail if it only measured science by its usefulness. I hope for a society which views fundamental science with more room in its heart.” I believe his words are directly relevant to the ILC as well. Though our lives will not be immediately altered by unlocking the mysteries of how our universe came to be, a question common to all humankind, the growth of people and technologies are driven by the very act of taking on this challenge. The power of science and technology, in particular fundamental science, lies in its ability to shape human history, to cultivate people with inquisitive minds, and give back to the society the knowledge and technologies developed in this process. The greatest value of the ILC lies in this point. At present, under the steady leadership of Prime Minister Abe, the public and private sectors are working together to take on the challenges of the upcoming Tokyo Olympics, as well as the plans for stability and steady growth after that. Our mindset is to internationalize this country and to grow together with the rest of the world. We are constantly thinking of what Japan, with its stable political administration, can do to contribute in terms of international cooperation. I am sure there are many of you here in the audience from the UK or the US. The results of the UK referendum on Brexit and the US presidential election show a global tendency to focus inward, and to shy away from international cooperation. I am much concerned about this. Behind these issues are conflicts related to immigration and differences in race, religion, or culture – a “Clash of Civilizations” as foreseen by Prof. Samuel Huntington in his book from 1996. There are various civilizations in the world such as the Western, Hindu, Chinese, Islamic, and Latin American civilizations. His book predicted the problems occurring today between the different civilizations. In this book, Japan is described as having its own distinct civilization. We are constantly thinking, from a political viewpoint, of how Japan can help bring harmony to the world. One answer is to bring harmony to the world through science, a language and culture common to all humankind. This is a new way for Japan to open itself to the world. Science is indeed the language to bring the world together. At CERN, many scientists come from all corners of the world with political and ideological differences. The fact that they can collaborate is proof that science can bring harmony. President-Elect Mr. Trump has called for “America First” during his campaign. Now is the time for us in Japan to propose something different: “Science First” – The ILC will be its symbol! It would be a marvelous thing if Japan could be the place to bring the world together by science. With “Science First” as our slogan, we hope to work with the world to provide a place for science and innovation. As Prof. Huntington said, Japan has its own distinct civilization. And I’m certain that we can play a leading role in this endeavor. This the very reason why Japan wishes to bring the world together by “Science First”. I think the ILC will be at the core of the flow of science through the history of humankind. You are probably used to thinking that the ILC is where collisions take place. Don’t forget that it will also bring harmony to the world. Harmony is at the heart of the country of the rising sun. Let the ILC be the ray of hope to shine the world.